From my perspective as a reader, these are some of the vivid tropes and themes in Lovebirds: technology; social media; business; mirrors; gods; angels; God; marriage; luck. Permeating Lovebirds, there is a refined testimony of ancient, enduring human themes mixed with contemporary technology and ongoing concerns. To save on duplicating auras on twitter . . .
It’s good to be wise, better to be lucky. II. Questions & Answers. Q = me. A = Tosin. Q: What is it about mirrors? 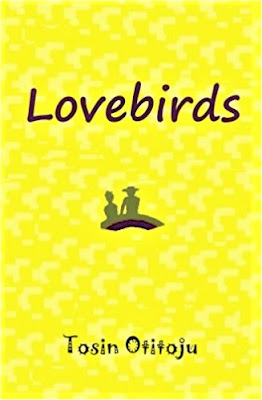 Q: Lovebirds is timeless, but also of the contemporary tech world. What kind of impact does tech have on love and social relationships? A: In this collection I hoped to do love and romance, but I'm delighted that it also had an interesting setting, namely, tech. So it's romantic, but it's robotic. Tech is a thing masculine and robot-like, which would seem to be the opposite of romantic. It's physics, chemistry, planets, science, feedback amplification, bits/bytes/packets/cyber, twitter. By the way, Janelle Monáe did androids too in her music, a whole album titled The ArchAndroid, and that's specifically why I had the guts to choose "Android Love" for the title of the poem I placed first. I think of this as the "overture" introducing the opera, the robot opera. Q: How does business figure into Lovebirds? And other systems? A: Another example of the hard-edged - calculations and robots - in what should be soft and romantic. I mean, in the realm of love, who thinks of mergers and cost-savings, hedges and insurance? Then again, who doesn't - I mean who doesn't among people who think in these terms about almost everything else? And once you discover that there are planetary systems with multiple suns, won't your love poetry or even your mythology shift to include this image of a "two-sun dance"? And if your work includes experiencing or understanding positive feedback loops, when you then consider thoughts feeding on similar thoughts, or an image feeding on its mirror image, or two people sharing synchronized feelings, won't you deduce or imagine resonance, system overheating, heightened excitement, or that screeching noise from the microphone-with-speakers? In summary, at the center of this collection is a love, mystical, old-fashioned, yearning, and poetic. Yet in the poems we find hints of academics, mathematics, technology, science, business, and so on. For example, there is the "Definition" which feels quite formal to me, like something I would do in math and I presume others would do in law for instance - begin a study of a thing with a precise definition and logically go through a proof, examples, corollaries and the rest. I adore this definition of love. I tried to get it in Wikipedia but some gatekeeper kept rejecting it. That was annoying. I'm expert enough to provide a definition of love! I get annoyed with things like this. It would take another page to explore and explain the annoyance. Q: In several of the poems, there is an interesting interplay between different ways of perceiving reality. For example, gods and God are mentioned, angels, ghosts. Do they all exist simultaneously in some kind of dreamscape? A: There's a bit I'm not saying about the angels, ghosts, and shall we say more mystical experiences that inspired this love and parts of this collection. 2015 or so, I told my good friend (an ex, naturally) that I was in love with someone online even though it was not an affair and there was no actual talking and how very psychic everything was from day one. I was amazed that he understood. In public, I won't talk like that for fear that they still lock people up in mental institutions - do they? I also told a very young friend (a veritable cool kid, some sort of art student, teenager, in university abroad) and he understood too. He said, oh, you mean subbing. Apparently, young people did that all the time - relating privately on social media through subliminal but public messages. Then they collectively dumped twitter and moved on to...what was it the youngsters moved on to? Instagram? SnapChat? Let's just say this: I am very thankful to the muses for this work, and very thankful to one major muse - wink, and thankful to God, and to ... I usually don't write acknowledgement pages because it's so impossible to truly pin down all the major inspirations for a work. I don't feel as psychic today as I did in those days, and I think it's because this work is done? Aside, there's a child that lives in my compound, who's back today from two weeks away at Grandma's. I wish I had the talent to write about her - the way her voice makes me feel. It rings like a bell. She talks simply all the time, and I simply die of happiness at her enthusiasm. Oh I love the other kids as well - the one that just learned to talk animal talk to invisible friends, startling her mother, and the littler one whose voice I haven't found yet, although sometimes she cries, and now she calls my name when she sees me. We had a lot of additional kids here for the holidays - some boys for a change hohoho. Anyhow, I pray one day for the talent to explain the beauty that is her excited talking. She was just shouting something now, I think they were making play-food and she was inviting the others to eat. A: [See this link]: I'm still writing. Note: We did a Q & A session in 2011 that is available in two parts. One of the topics was the beauty of Yemen, but this is too painful a topic to revive here, given the ongoing war and its catastrophic impact. Maybe we can speak of it down the road, when peace is brokered. October 10, 2011: Interview with Tosin Otitoju, Part One. October 11, 2011: Interview with Tosin Otitoju, Part Two.